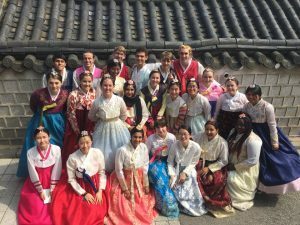 Kyla is from Denver, Colorado and participated in the 2018 Korea summer program. 안녕하세요! 저는 카일라입니다. 콜로라도 주에서왔습니다. 이번 여름에 한국에서 공부했습니다. 한국어를 많이 배웠습니다. 한국에 다시 가고 싶습니다. 한국어를 더 공부하고 싶습니다. 제 이야기를 즐겁게 읽어주셨으면 감사하겠습니다! Hello! My name is Kyla and I am from Colorado. 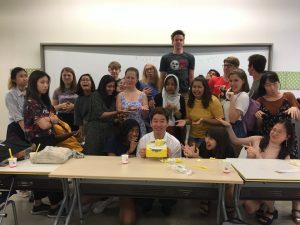 I studied in South Korea this past summer and I learned a lot of Korean. I want to go to Korea again and study more Korean. Please enjoy reading my story! I had never been away from my family for more than two weeks, let alone in a foreign country where I didn’t speak the language and didn’t know anyone. Up until a few days before Pre-Departure Orientation (PDO), I had been perfectly fine. However, I inevitably began to think about everything that could go wrong. The “what ifs” kept me up all night and worried me throughout the day as I packed the suitcase that would contain my belongings for the next six weeks. This is because I have a generalized anxiety disorder. I was filled with so much anxiety and nervousness that I got to the point where I wondered why I had even applied for the program. It was difficult to rein in my thoughts and get my head to stop spinning out of control. I focused on everything that made me want to apply in the first place. I focused on how much I wanted to learn about this other half of my identity by learning about Korean culture and language. I focused on how much hard work and effort I dedicated to getting into this program. I had to keep telling myself positive things over and over as I got on the plane that would take me far away from my safe, familiar home. Flash forward to the first night of PDO in New York. They gave us letters to write for ourselves that they would give back to us after we finished the program. By that point, I was still worried sick about some of the most ridiculous things, like if our plane fell out of the sky, or if all of the students on the program didn’t like me (even though they seemed like the kindest people I’d ever met). Looking back, I can still remember feeling fear in the pit of my stomach. So I wrote with complete honesty about every crazy emotion that I was feeling, but I also laid out 10 goals that I felt I needed to try to accomplish while I was in Korea. I knew that if I tried to accomplish these goals, I would be proud of myself. It was such a relief to pour out every emotion that I was feeling onto that piece of paper and put it in the envelope. I held onto my hopes and tried to leave all of my negativity in New York as we got onto our plane two days later, but when we were on the 14-hour long flight to Korea, I couldn’t sleep. I was worried for what this summer had in store for me, but I kept reminding myself that there were surely also some amazing experiences ahead of me. I had mustered the courage to make it to that point, and there was no turning back. I had to make the best of everything that came my way. To my surprise, after my first few weeks in Korea, I wasn’t feeling nervous anymore. I’m not saying that my anxiety magically disappeared, but was rather like the volume of my anxious thoughts was turned down so low that sometimes, I could forget that it was even there. Looking back, I think that there were many factors that led to that, but most of all, I think it was the people around me who encouraged me to believe in myself. All of the other students on the program were kind, supportive, funny, and great people to be around. I miss each and every one of them. When I was with them, I felt like I was with my people; I felt like I could actually be myself and it would be enough. On top of that, my host family was absolutely amazing. Although it was nerve-wracking for both of us when I came to Korea, I quickly settled in. They were all so eager to help me learn and grow. 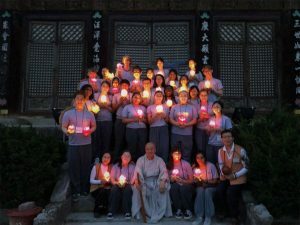 Even though there was a large language barrier between my host family and I, they would always ask about my day, what I did, and what I learned. When I had a long day or didn’t get a perfect grade on a test or quiz, my host mom would always quickly type into her translating app and tell me that as long as I tried my best, it was okay. By the end of the six weeks, I didn’t feel like a guest in their home, I really felt like I was a part of their family. On the morning of our departure, we were saying goodbye to our host families when they handed back the letters we had written to ourselves. In all honesty, I had completely forgotten about the letter and had no idea what I had written. It felt like we had written those letters a thousand years ago. So much had happened and so much had changed. When I read my letter, I began to cry. I could see myself just six weeks ago writing out these words of fear and worry and realized just how far I came. The biggest part that stood out to me was when I wrote, “There is a part of me that wishes that I could go back home and just dream about going to Korea rather than actually doing it. That would be a lot less scary.” Now, I can’t imagine being scared of going on this program. I had some of the best experiences of my life and made memories and relationships that I will hold on to forever. I am proud to say that I accomplished every single one of the 10 goals that I had set out for myself while I was in Korea. So yes, there were hard days when my anxiety was high and there were times when my worrying thoughts were all that I could hear, but I didn’t let it take control of me. I learned that I don’t have to bear the burden of anxiety by myself. In Korea, there were always people there to support me and help me through. After going through this amazing adventure, I realize that my anxiety won’t ever hold me back or get in the way of accomplishing my goals. Not only did I realize that I have such an amazing community of people to lean on, but I also learned that I am stronger than my anxiety. The only thing that can get in the way of me is myself. I now choose to try and block out the negativity, not add to it. I want potential applicants and future finalists to know that if you have a mental illness, this summer may be more challenging for you compared to others, but that just means it will also be more rewarding because you will know how hard you worked to get there. Don’t let fear get in your way because if you do, you might miss out on the experience of a lifetime.